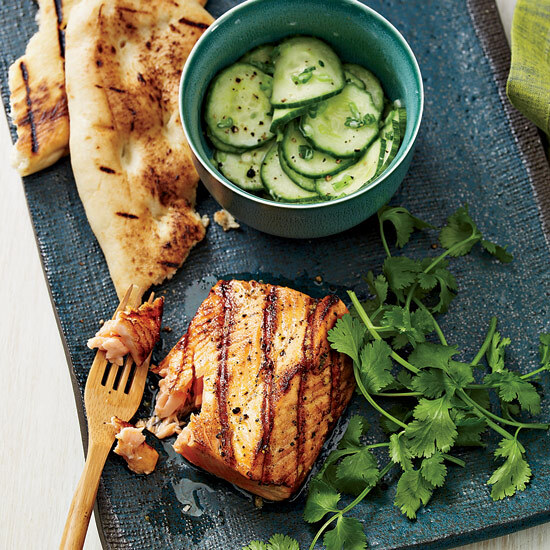 Salmon is, of course, delicious simply cooked, especially when it’s fresh and wild-caught, but it also works well with bold spices and deep earthy flavors. Here are 11 things to do with this incredibly versatile fish. 1. Cook the whole side. If you’re serving a crowd, you can grill or roast a whole side of salmon. Season it with salt and pepper, and serve with a lemon-yogurt sauce. Or try something more exciting: Coat the fillet in a tandoori marinade, rub it with a spicy paste or serve it with melted tomatoes and jalapeños. 2. Treat it like beef. Salmon is so meaty, you can make a red wine sauce—with thyme and balsamic vinegar or with beef stock and mushrooms—to go alongside. 3. Toss it in pasta. Simply cooked leftover salmon is delicious in spring and summer vegetable pasta dishes, like this orecchiette with salmon, arugula and artichokes. 4. Put it in a sandwich (or a taco). Treat it like lobster and make a creamy salad to serve in a hot dog bun, or tuck it into tortillas with cabbage, cilantro and salsa for tacos. 5. Add it to hash. Smoked salmon for brunch is standard. But how about cooked fresh salmon with potatoes and poached eggs? Yes, please. 6. Make cakes (or burgers). Blend with mashed or cooked chopped potatoes to make classic salmon cakes. You can skip the potatoes and just use salmon, herbs and seasoning for burgers. Or try this gorgeous Asian-inflected riff—black sesame seed–coated salmon balls. 7. Jar it. Pork rillettes—hunks of meat that are cooked until they melt into a spread and then packed in a jar—are a humble wine bar staple. Try this luxe version made with both fresh and smoked salmon. And pass the Champagne. 8. Give it a hot oil treatment. Bathe sashimi-style pieces in hot oil so they just barely cook. 9. Glaze it. During the last few minutes of cooking, brush fillets or steaks with a mix of soy sauce and honey or soy sauce and maple syrup for a crowd-pleasing sweet-and-savory glaze. 10. Add it to potpie. Make a creamy salmon stew, spoon into ramekins or bowls and top with a lid of baked puff pastry. 11. Smoke it. If you don’t mind a (small) project, you can rig a smoker in your kitchen; the salmon is done in five minutes.